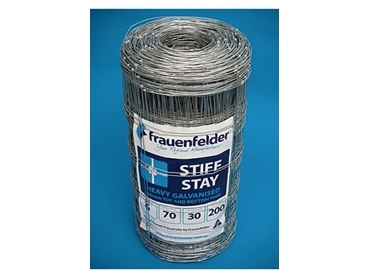 Stiff Stay is the latest prefabricated fencing from Frauenfelder and is manufactured using new equipment and some of the latest technology. The fence features a clean smooth knot with no sharp wire ends to protect livestock from injury. Each roll has 450mm long line wires at the start of the coil for tying off to the post at the end of the coil to make the choice of joining method your own. Available in a range of wire configurations to suit individual requirements, Stiff Stay has vertical packets which are spaced at 50mm, 75mm, 100mm, 225mm and 300mm. When the wire is spaced at a minimum of 100mm to 10.2m, this becomes ideal for horse fencing worldwide.